Want a hot, New Hairstyle, We can Hook You up! With Sensationnel's new SNAP, You can go with your mood and change your style while keeping it affordable. Made of the finest quality synthetic fiber with the look, luster ad texture of natural hair. SNAP is the easiest way to get the hottest styles. 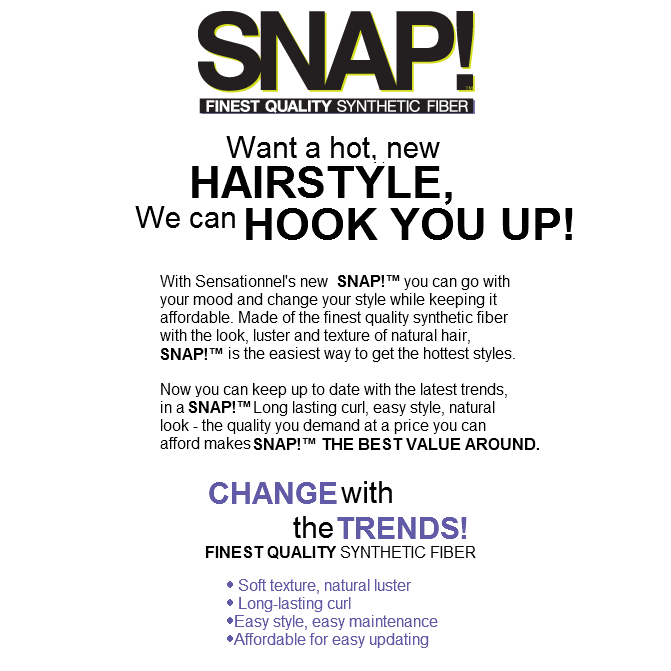 Now you can keep up to date with the latest trends, in a SNAP Long lasting curl, easy style, natural look - the quality you demand at a price you can afford makes SNAP THE BEST VALUE AROUND.